That’s the vision of MIT researcher Andreas Mershin. He says the process has been simplified to the point that virtually any lab could replicate it — including college or even high school science labs — allowing researchers around the world to start exploring the process and making further improvements. The new system’s efficiency is 10,000 times greater than in the previous version — although in converting just 0.1 percent of sunlight’s energy to electricity, it still needs to improve another tenfold or so to become useful, he says. 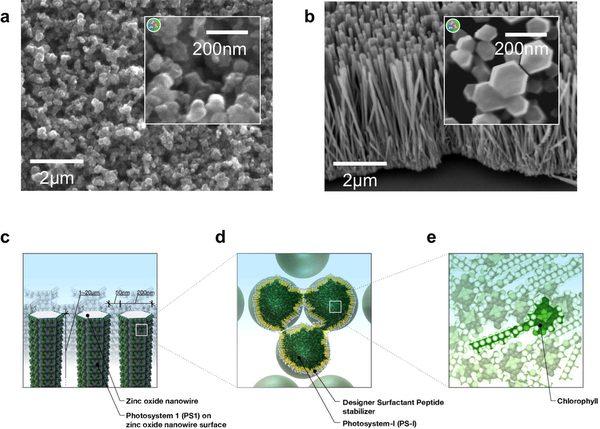 Mershin was able to create a tiny forest of zinc oxide (ZnO) nanowires as well as a sponge-like titanium dioxide (TiO2) nanostructure coated with the light-collecting material derived from bacteria. The nanowires not only served as a supporting structure for the material, but also as wires to carry the flow of electrons generated by the molecules down to the supporting layer of material, from which it could be connected to a circuit. “It’s like an electric nanoforest,” he says. As an bonus, both zinc oxide and titanium dioxide — the main ingredient in many sunscreens — are very good at absorbing ultraviolet light. Because the system is so cheap and simple, he hopes this will become a “way of getting low-tech electricity to people who have never been thought of as consumers or producers of solar-power technology.” He hopes the instructions for making a solar cell will be simple enough to be reduced to “one sheet of cartoon instructions, with no words.” The only ingredient to be purchased would be chemicals to stabilize the chemicals, which could be packaged inexpensively in a plastic bag.